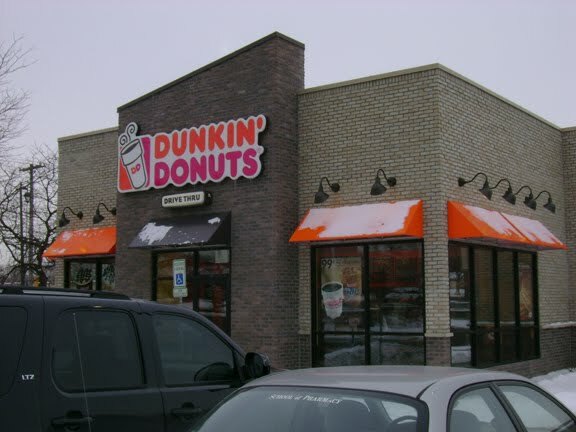 In a hurry to scoot out of the house to run some errands the other morning, I accidentally skipped breakfast so I decided to stop in at Dunkin' Donuts for the first time since they opened in KC. 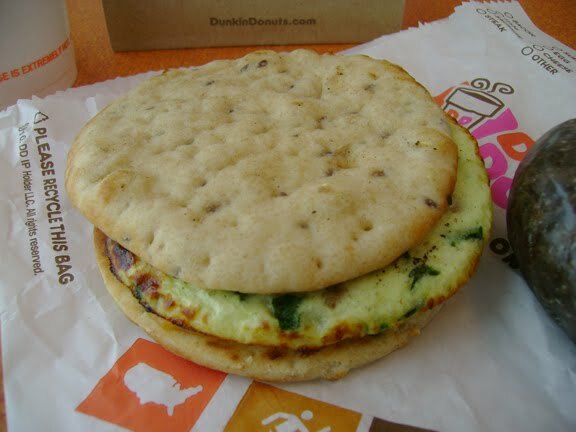 They've got those flatbread sandwiches that are supposed to be not entirely horrible for you, at least relative to something like a McGriddle. A delicious, delicious McGriddle. I stepped up to the counter and ordered an Egg White Turkey Sausage Flatbread and an extra large cup of coffee. 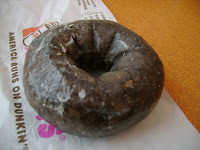 And feeling pretty good about that healthy decision, I went ahead and got a chocolate glazed donut, too. Come on -- they have a wall loaded with donuts from top to bottom and it was staring me down. I blinked, and the donut wall won. Who am I to resist? Sitting down with my food, as I unwrapped my sandwich I started to grow a little wary of it. Egg whites taste close enough to full-on eggs that I'm fine with them, but they also tend to look like the foodstuff version of a dry erase board. Plus, what with the way these egg whites contrasted against the deep green bits of spinach that were cooked in, they looked even filmier. …said the guy who also got a donut. Which is me. 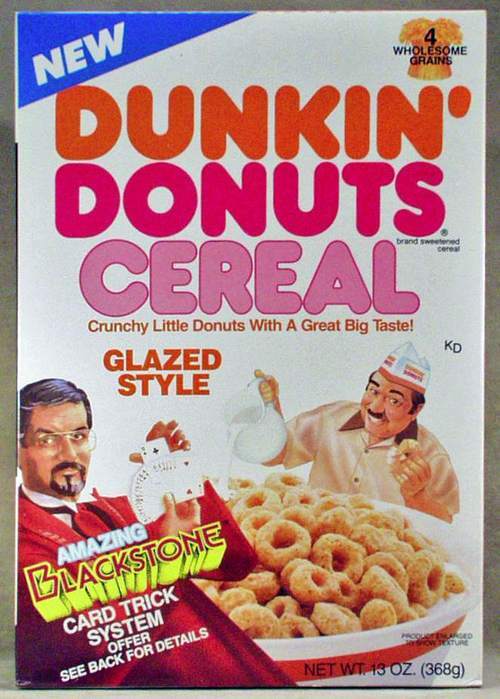 And while I've never confused donuts with health food, until I was writing this I had no idea one of these things weighed in at 370 calories. How long until we figure out how to make turkey chocolate? People seem to be pretty bonkers for Dunkin' Donuts coffee, so I thought at least I'd finally get to see what all the fuss was about, but once my drink finally cooled down it didn't taste any better than your average burgerdoodle brew. After my first sip, I couldn't muster much enthusiasm for the rest of my monster cup. Really, all this is my own fault for attempting to make a healthy choice at a fast food place. Next time I'm just going to go ahead and get the McGriddle. With hot fudge on the side for dipping.